The managed security services market is expected to almost double by 2020, from $17.02 billion to $33.68 billion. And even though small businesses are getting better at warding off and preventing cyberattacks, they’re not unheard of. That being said, it’s important to make sure your prevention methods are airtight and help to truly minimize the risk of any type of cyber threat. Here are just a few mistakes small businesses don’t want to make when developing a cyberattack prevention regimen. Having a strong, reliable, and secure WiFi network is essential for all types of businesses. Don’t think yours isn’t in need since it’s not an inherently ‘technical’ company. “For many small businesses, WiFi is a fact of business life. You can make the one you use at the office more safe and secure by checking the WPA2 standard. It’s the latest best in WiFi security. Get into the admin section on the router and look at the Security Options to find out if you’re covered,” writes Rob Starr on Small Biz Trends. The phrase ‘know your enemy’ truly takes on a new meaning when it comes to cyberattack prevention. Invest in support that helps to expose your company’s weak points in IT management. From there, you can start from the ground up and rework the network for a more reliable and secure system for employees and management alike. Skip this step, and your business’s weak points will remain exposed and open for attack. A 2015 survey reported that 66% of businesses surveyed used an outside IT firm in the previous year. With these numbers in mind, it should come as no surprise that third party business computer support services can help to optimize your network efficiency and security through each and every day’s operations, leaving no stone unturned when it comes to keeping your business inherently safe. Ultimately, cyberattack prevention is an important initiative that all small businesses should be taking on. 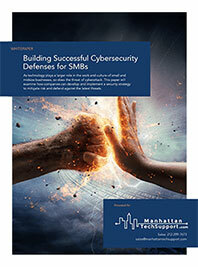 In fact, over half (55%) of small to medium-sized businesses were victims of cyber attacks within the last 12 months. For more information about business computer support services and other types of computer consultants, contact Manhattan Tech Support.